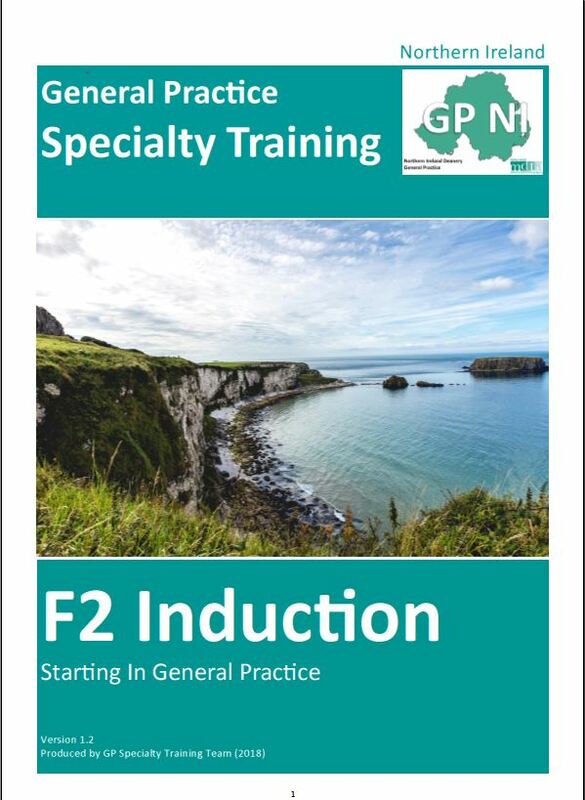 Welcome to the General Practice Foundation Programme. You will find that working in general practice is different to working in hospital. You will have the opportunity to work as an integral member of a small organisation. You will learn new things such as recognising illness in the early stages of presentation, how to deal with uncertainty and to take appropriate risk in managing patients in the community. You will develop skills in clinical decision making and working in partnership with patients. We hope you enjoy your time in general practice and that some of you may even want to become the GPs of the future. You should find all the information that you require during your General Practice post here. The Northern Ireland deanery has responsibilities to ensure quality control of the foundation programme. The trainers in General Practice (GP) have a specific role to deliver within this organization. Will F2 be working in their trust hospitals at nights or weekends? Can an F2 do Home Visits? Is there a contract between F2 & the training practice? Trainers are advised to sign an “educational contract” with F2.The legal contract is between the Trust and the F2. Will NIMDTA be organising central computer training? There are three main computer suppliers & three types of EMIS within that. Each practice uses different templates and has customised their screens in different ways, so computer training is perhaps best done locally. However there is a list of induction competencies available for computer learning that could be delegated. Should each F2 be provided with their own emergency bag? Yes the filling of this bag could be one of the induction tutorials. Once you are in GP land and fully registered you would be expected to assist in any medical emergency that comes your way and coming straight from hospital they are often well equipped with these skills. These bags can be bought as simple tool boxes from local hardware stores. What duration are the consulting slots for F2? Initially 30 minutes. Then depending on confidence and competence reducing to no shorter than 15 minutes. Are videos to be used as part of the assessment? There is no video for submission.Trainers are expected to facilitate Work Based Assessment. Each F2 will need to do one TAB Feedback, and two Mini CEX / DOPS / Case based discussion. The video could be a way of assessing Min CEX. The video is a powerful developmental tool in learning, but it should not dominate the attachment. Do we need to contact MPS to confirm details? F2 should be expected to arrive and present evidence of up to date and valid Medical Protection (organised through their Trust) & GMC registration. This should be part of induction for all Doctors entering GP. Can F2 run acute clinics? Yes, acute clinics are a powerful learning opportunity.These F2 doctors will often end up in secondary care careers – it is vital they know what goes on in the real world of general practice. They should be given the opportunity to see everything – but supervised closely. Could F2 run Chronic disease management clinics? Yes, again this could be a great learning opportunity to work with the Practice Nurses. How much teaching time does each trainer intend to provide? Similar to what we give the ST3’s.It’s the same training grant, but more supervision will be required during surgery sessions and the service delivery by F2’s may be less. It’s very important to use trainer time efficiently – trainers could work in groups to deliver teaching. This reduces workload, but improves the quality of teaching through small group work and varying instructional methods and each trainer will have different skills. How many surgery sessions should F2 Doctors be booked for? About seven each week – some of these will need to be cancelled for core days. With European Working Directives junior doctors are missing out on experience so it is vital to maximise exposure to real learning situations – balanced with protected learning. How much time for orientation into GP before starting consulting? There is an induction package on the NIMDTA website. A list of tasks and competencies that is standardised, comprehensive and realistic could be covered within the first week. Consulting could start as early as the second week – because learning is easiest if relevant to daily practice. Can F2 be sent to other practices for group training? Absolutely – to be encouraged; there are many advantages to all concerned in this style of learning. Who pays for any equipment? Same as for ST2 and ST3’s; these would be practice expenses. They should provide their own doctors bag, stethoscope, ophthalmoscope & auroscope. By their Trust that they are aligned to during that time. Will F2 be paid for travel to Home Visits? Are we restricted to the DOPS as listed in the Guide? No, DOPS could include spirometry, vaccinations, cervical smears, dressings, rectal, PR and genital examinations. How much protected teaching time does NIMDTA expect? In total the same as with a ST2 or ST3.But there may be more supervision required during surgery sessions, which could reduce the amount of time left for one on one contact teaching. F2 could also have one session of self directed learning each week. How can Trainers reduce paperwork of assessment required for F2? Two DOPS / CEX / CBD – that less than with the ST2 or ST3 – No Trainers report or OOH workbook.The F2 is responsible to ensure timely completion. How much study and holiday leave should be taken each 4 month rotation? One third of their annual allowance – eight days – unless special circumstances are applied for in writing to NIMDTA. What is NIMDTA organising for F2? Programme Director – Dr Fergus Donaghy will organise 2 half days each four month rotation – Induction and Audit. All F2 trainees should be given the opportunity to undertake HV. F2 must inform their motor car insurance companies they intend to work in GP – this involves carrying drugs in their car and undertaking home visits.